I'm all excited again. Decided to redesign the rear wheel paddle boat. Here are my rough drawings. Placing rudder back in the middle, which uncomplicates the twin rear rudder. Still going to have rudder in rear, but extending below hull a bit. Seen sailboat plans and copied them. Now that I am redesigning to fit equipment I have, I can have the gas tank, engine and battery all lined up at the rear. This will place the engine in the center for best weight support. I may also center the gas tank, and may move it up foward. Not sure where I want to steer the boat from, and may build boat and then decide. No extending upper deck, which will place wieght where it belongs, below the water line. 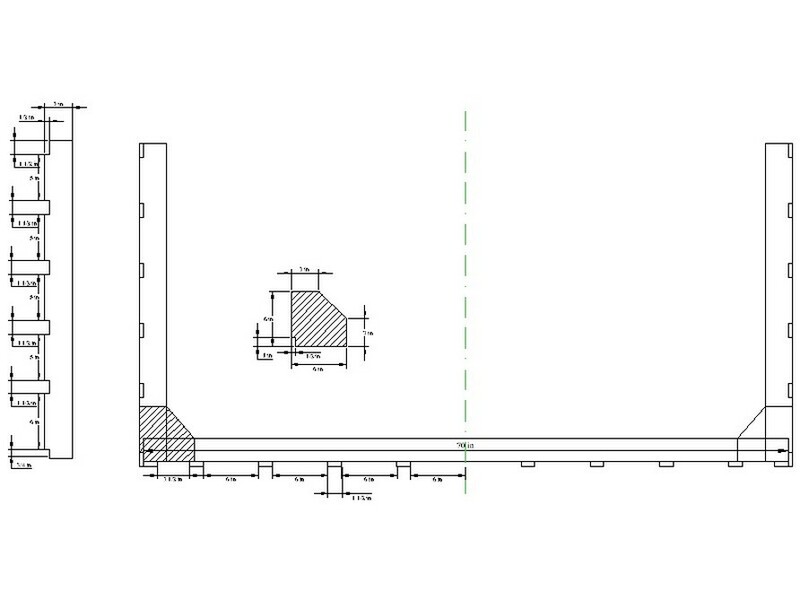 Will have 8' interior deck space, which will give us a nice area to place benches and such. 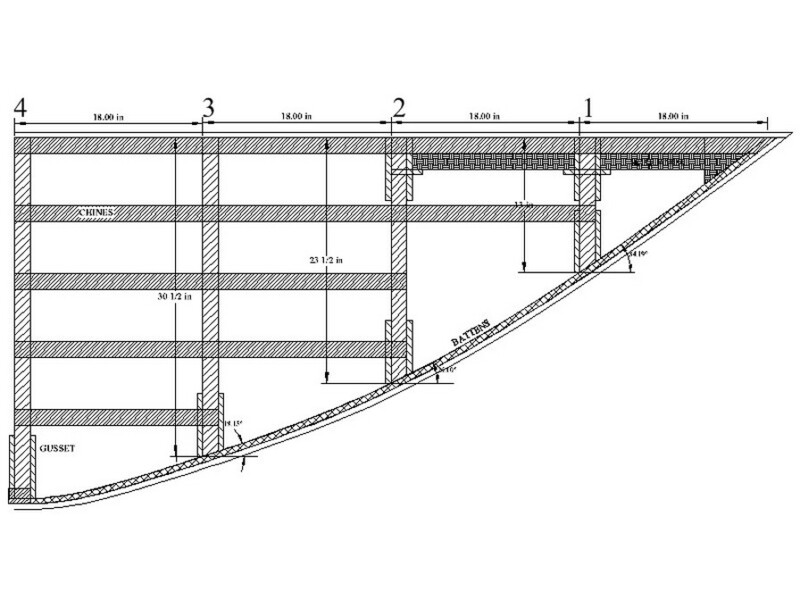 Here is the boat design in autocad. It was not until I was making the autocad version of the boat, that I discovered I had inadvertanly left out the number 11 in calculating the length of my boat. 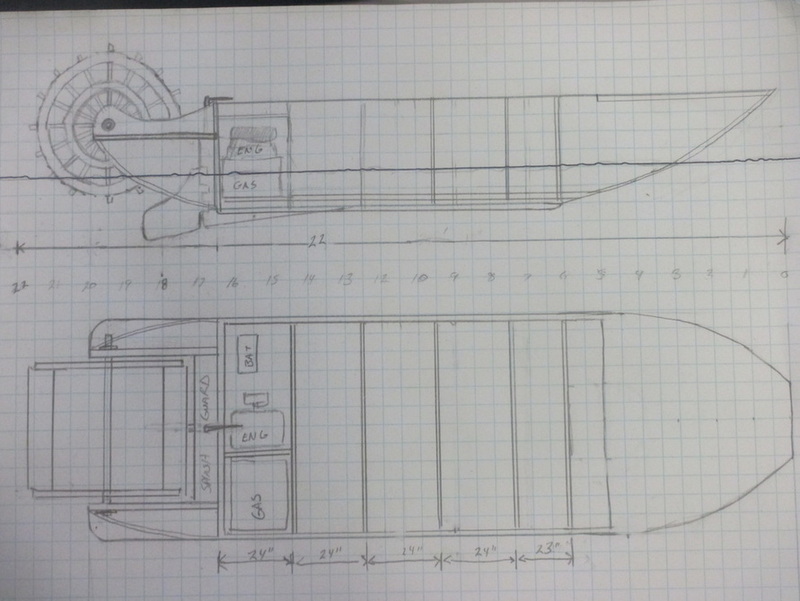 Here is a rough Idea of the new boat design. I removed 8 paddles due to the distance between them. The 6' paddle wheel had a spacing of 18" and the 4" wheel would have had about 6" spacing. But removing 8 paddles restored the spacing to 18". Here are the messurements for frames 4 -8. The chines are set within notches, while I have the battens simply attached to the bottom to allow water flow. I also added gassets to ensure the sides of the hull are 90 degrees. 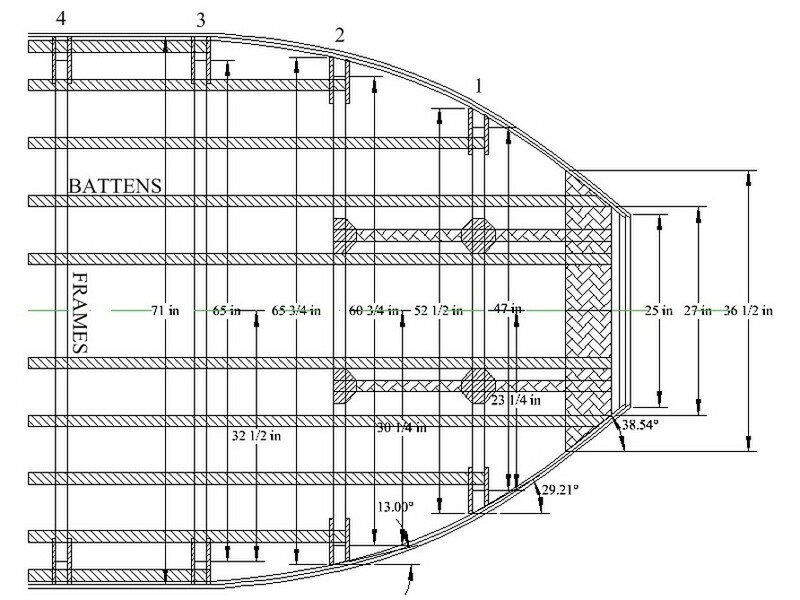 Here are the BOW SIDE DIMENSIONS. Going to place gussets on either side of the side frame members and the bottom frame members. This will make where you only have to set the saws angle once per frame. Bow Bottom Dimensions: Displayed are also the gussets to align the nose form. 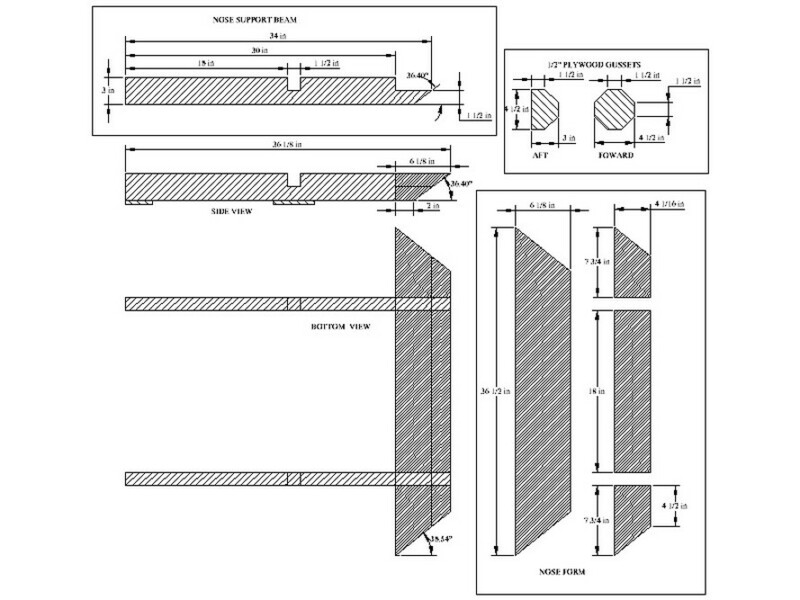 Just added Frame 1-3 to Plans page. 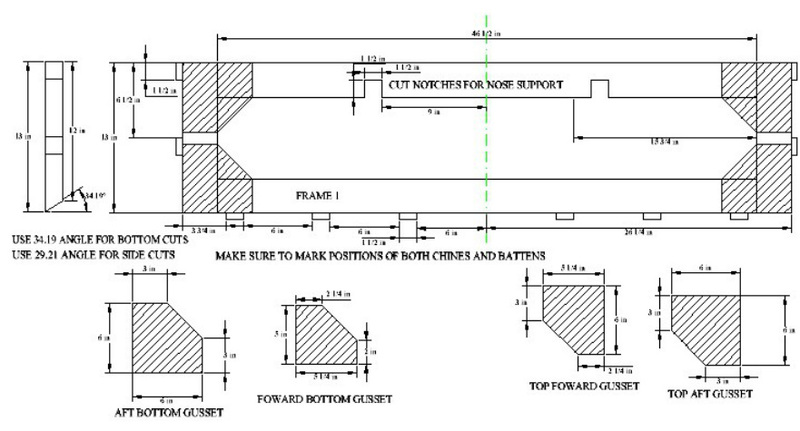 Notice notches for nose form supports. Nose for will have two beams to support it stretching all the way to frame 2.Will have hexagon shape gussets to help align the nose. Alright. Just finished the Nose Form diagrams, which completes the foward half of the hull. Soon as I do frames 9, 10 & 11, I will be ready to begin contrustion. If have questions or comments, feel free to send them in.